MADISON, Wis. — Republicans in the state legislature may have protected their legislative majorities because of the rigged district lines they drew after taking complete control of state government in 2011, but a closer look at the results of the 2018 midterm elections in Wisconsin confirms that voters delivered a mandate to Democrats who swept every statewide election on the ballot. 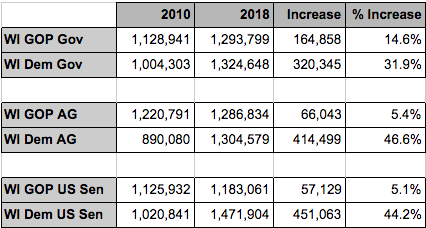 Wisconsin’s November 2018 voter turnout far exceeded recent midterm elections in 2010 and 2014 and was even higher than the 2012 recall election for governor. In fact, the Wisconsin 2018 midterm voter turnout was higher than the national average turnout in the 2016 Presidential election. Democratic candidates Josh Kaul and Tammy Baldwin showed gains of over 46 percent and 44 percent respectively in the statewide contests for Attorney General and United States Senate. Republicans in the legislature were clearly the beneficiaries of rigged district lines they drew for themselves after seizing control of state government in 2011. For example, the GOP candidates for the state Assembly received only 45 percent of all the votes cast in all 99 contests yet they will hold 63 seats in the upcoming 2019 legislative session.